Pattern Discovery: Products Liability provides techniques and strategies for the principal discovery methods for quick, complete, and economical fact-finding in products liability cases. To ensure coverage of all the crucial elements of your case, from initial intake through pretrial discovery and trial to appeal, the authors have included a volume on litigation checklists. 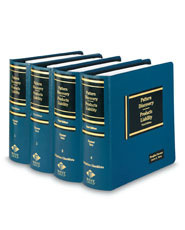 The set includes information on pattern interrogatories, including over 50 sets of interrogatories covering many of the most common products liability situations, requests for production of documents and things, requests for entry upon land for inspection and other purposes, deposition checklists, and litigation checklists. For your convenience, the forms are included on CD-ROM, and a glossary of medico-legal terms is provided.